DES MOINES, Iowa, June 6, 2017 – Today DuPont Industrial Biosciences (DuPont), announced the launch of DuPont™ Syncra® SWI, an adaptive feed additive that powers the diet through improving energy and amino acid digestibility for grower and finisher pigs, thereby improving growth and reducing feed costs. With this highly researched and tested solution, swine producers in the United States and Asia-Pacific regions can maximize feed efficiency and achieve consistent growth performance for sustainable profitability. DuPont scientists have found that Syncra® SWI delivers exceptional consistency, with 75 percent of Syncra® SWI animal trials showing a feed conversion ratio (FCR) improvement of more than 3 percent. This reliability ultimately helps reduce costs for swine producers. When applied to a corn/soy/DDGS-based diet for grower-finisher pigs, producers can achieve cost savings per short ton of $5.00 to $13.00. 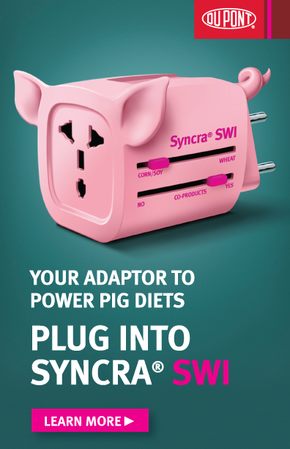 Syncra® SWI delivers unique energy and amino acid digestibility for pigs, powered by the probiotic’s agile enzyme-production, working in harmony with the protease. As a live and responsive organism, the multistrain probiotic adapts its enzyme production profile to the available substrate in the pig’s small intestine, enabling the same additive to degrade substrate in many different feed ingredients, thus powering the protease component. This solution strengthens gut barrier and stimulates short-chain fatty acid production in the hind gut, contributing to enhanced gut health. Further, the probiotic in Syncra® SWI consists of spore-forming Bacillus strains that are highly stable to heat and processing, allowing unstable enzymes, which would not normally survive pelleting or the stomach, to be delivered safely to pig’s small intestine, where they are needed to break down substrate. DuPont Industrial Biosciences works with customers across a wide range of industries to make products and industrial processes more efficient and sustainable. Through a unique combination of agriculture, biotechnology, chemistry and material science capabilities, we advance market-driven, biobased solutions to meet the needs of a growing population, while protecting our environment for future generations. For updates about how DuPont Industrial Biosciences is helping customers deliver cost-effective products with superior performance and sustainability, follow @DuPontBiobased on Twitter or visit our website at http://biosciences.dupont.com. DuPont (NYSE: DD) has been bringing world-class science and engineering to the global marketplace in the form of innovative products, materials and services since 1802. The company believes that by collaborating with customers, governments, NGOs, and thought leaders we can help find solutions to such global challenges as providing enough healthy food for people everywhere, decreasing dependence on fossil fuels, and protecting life and the environment. For additional information about DuPont and its commitment to inclusive innovation, please visit http://www.dupont.com.